PUTTIN' ON THE RITZ! 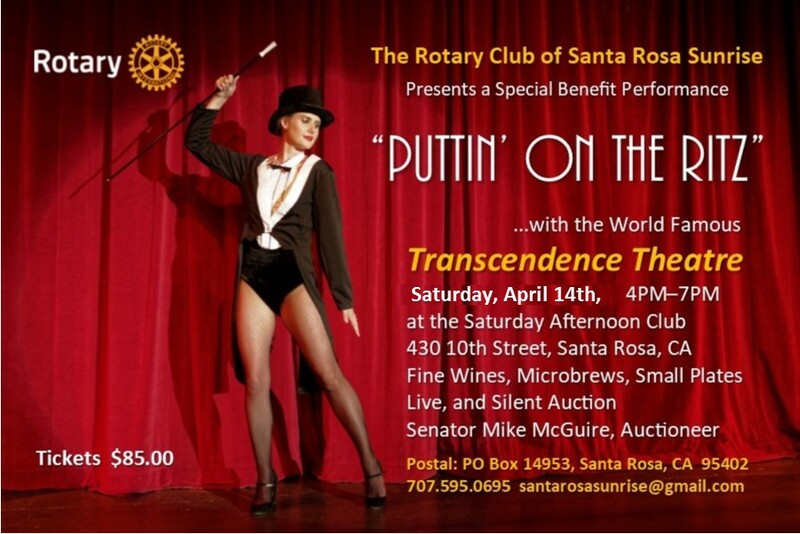 is our very special benefit performance starring the world famous TRANSCENDENCE THEATER COMPANY! The festivities will be held on Saturday, April 14th, 4:00 to 7:00 pm at the Saturday Afternoon Club, 430 10th Street, Santa Rosa. Sip excellent wines and local microbrews, savor delicious hors 'd oeuvres, hob nob with (local) royalty and help us to raise funds to put back into local and international community projects. State Senator Mike McGuire as our live auction auctioneer! All of this and much more for just $85! 1930's themed dress is encouraged! It'll be a huge success and a lot of fun! See y'all there! At the entrance whisper... "Flo sent me."